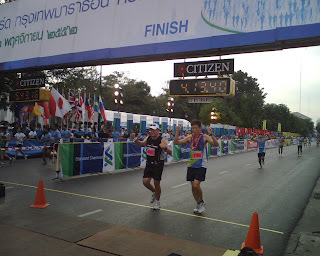 It was 4 months ago, when Me and my friend Jay threw the idea of joining an International Marathon. It was 4 months after we joined the Condura Run. 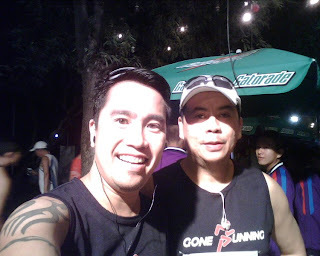 At that time, we were just joining 10k runs and starting to build mileage together with the rest of the Gone Running Club members. I immediately said Yes, and off we went and prepared our training plans. 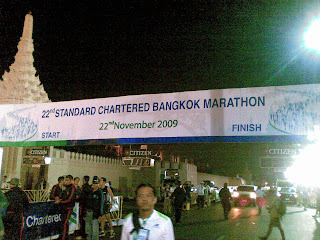 We have chosen the Standard Chartered Bangkok Marathon held in Nov. 22, 2009. Prior to the Marathon day, I only managed to build 498km in mileage due to the series of injuries that I was struggling with. The 16 weeks training period was dwindling down so fast and I have yet to do a consistent long run. I was still nursing my injury and it has given me a lot of pressure since I have declared that I will do my first marathon on that day. I have committed to do this task as scheduled and there was no turning back for me. I honestly am having doubts a week before the event if I can really make it. Good thing my knee were getting better as I have been attending my Physical Therapy as mentioned in my last blog. My goal was to finish my first marathon without injury. 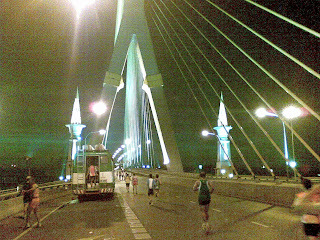 I have planned to do a run-walk strategy (9 min jog @ 7:30 min/km and 1 min walk @ 10 min/km). This would make me finish at 5:22. Though I wanted to finish with a good time, it was least of my priority. My only wish at that time was to finish below 6 hours without any injury. Jay and myself at the site around 1:30 a.m. There were two race starts for the full marathon. One is at 2:00 a.m. for those finishing between 5-7 hours and for female age group between 60-64 and male 65 and above. (No wonder I was running alongside a lot of elder who were really fit and fast, I admire them). The 2nd start time was at 3:30 a.m for those finishing within 5 hours. However, for the 1st start time, a lot of runners finishing below 5 hours have joined the 1st group. During my first 12km, I was consistently following my 9-1 strategy but I was going fast since my virtual partner in my garmin was showing that I was ahead by 8 min. You just can't resist when you feel strong and that no pain is occuring on your past injury. But I had to control myself and conserve my energy. I was focused with my 9-1 strategy and before I knew it, I was done with my 21st km. The next km after that was my farthest run so far. 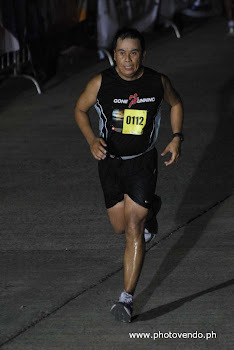 I began to pray that the Lord will give me the strength and the will power to finish the marathon. At this point I began to become nervous and concerned that my Injury will come out anytime. At km 22, I started to monitor my pace every km and forgot the 9-1 strategy. At km 25, my legs were so stiff and my ITB had slight pains but were manageable. It was good that there were free massage at selected aid stations, did some stretching and off I go again. I had to take my hammer gel every 30 min for the first 2 hours. I stopped at all hydration station and made sure to drink water and gatorade in order not to "hit the wall". I was eager to reach the 30th km since I will use that as my motivation that the remaining 12km should be manageable since my body is aware that I can finish 12km without any trouble (crazy motivation huh?). But it worked for me, as soon as I reached the 3oth km, I again hydrated myself, did some stretching and conditioned myself that I will start to run a 12km race. But the next 12 km was so hard, I had more walk breaks but I still focused. I intended to take more photos to highlight the race, but I was so stressed out and just remained focused to finish. At km 36, I needed to pee, I can't find an open establishment where I can go. Luckily there was a gas station and I took a detour went to look for the toilet. Then I went back and started to jog. At km 37, the 10km runners who came out from another street finally joined the group and they were all so fast and too many. The crowd became lively again, before they came the marathoners were all far apart. The 10k runners though made it appear that I was too slow (yes I was) and that I am being left alone as I was running too slow. Then it was down to 5km, I was excited and at the same time struggling. But the elders motivated me, I even saw lady on her 60's whose pace were faster than mine in some point. The elders both men and women were just so amazing. How I wish that we can all be as fit as them someday. 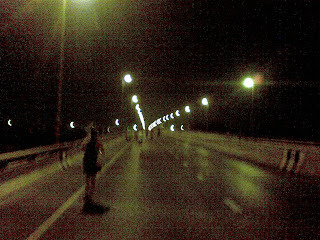 At km 39, I happen to run beside a local thai maybe on his late 50's. He talked to me in local thai and I just said, "I don't speak thai", he continued to converse with me and looked at his garmin and made a sign language "3 ", meaning 3km left. We then ran side by side, there was a time he had to walk and I continue to jog and vice versa. At the last km, we ran side by side and he demonstrated again that its 1km left. From then on we run together and finished at the same time. We shook hands at finish line and he said "Thank you, Thank you" and so did I. We both finished at 5:43:16 (unofficial time). This experience for me was really amazing. I have learned that anything is possible if you only put your commitment and dedication to it. Believing in your own capability and the ability to find ways to resolve the constraints that might stop you from proceeding is a key indicator for your success. This is an achievement that I will treasure as I was able to accomplish it the way I wanted it to happen. 1. There was a defined schedule for the start time per category. At the finish line, the marathoners, 10km, 5km runners were arriving almost at the same time. There was a dedicated lane for the finishers for 5k runners, 10k runners, and marathoners. In below photo, the right side is for the finish line of full marathon, and on the left is for the 5km and 10km. 2. Sufficient water aid station. 3. Mobile Toilets (I was not able to take a photo). 4. Massage on selected aid station. 5. Fresh banana on selected aid station. 6. Volunteers from a community prepared drinks and fresh watermelons. Very nice gesture. At the same time they were cheering the runners. 7. Some students cheered the runners as we passed by in front of their school. 8. Flags of participating countries were raised. The night before, Jay and his nephew went to the place for an ocular, (I was resting then). He saw our flag raised with the red color on top, he immediately called the officer in charge and told him the meaning of red color on top (which means in war). The organizer immediately apologized and change the orientation. 9. Eye catcher runners.. Batman here finishing his marathon. 10. There were medical support team after the race. Free massages, medical attention, ambulance in place both at the finish line and at the selected aid stations. 12. Announcement of names as you approach the finish line. 14. As soon as the race ended, the crew immediately take off the main signages. Very well organized and disciplined. Wow first FM na, International pa! Looking forward to riding with you guys soon! naks! congrats!!! ang ganda ng medal!!! Thanks Neil! Yes hope to ride with you soon.